The air of farce was unmistakeable on that grey, muggy evening in June. Inky clouds gave the night a threatening air, and the atmosphere was hardly less foreboding inside the Newcastle Labour Club, a building that sits in the shadow of St James’ Park on a sunny afternoon. 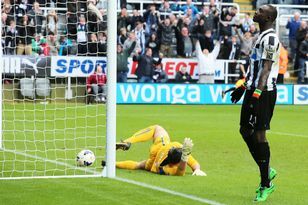 The season was six weeks away but on reflection, the dye was cast when a man called Eddie McIntyre rose to his feet to speak on behalf of Joe Kinnear, who had unbelievably been handed a lifeline in elite football by Newcastle’s defiant owner Mike Ashley. The newly coronated director of football had promised to attend – not the first or last pledge that turned out to be a bare-faced mistruth – but he had left his friend to face the flak and do the talking for him. “Give Joe a chance,” an animated Mr McIntyre implored to unimpressed fans. Newcastle’s supporters weren’t minded to give Kinnear the benefit of the considerable doubt, and they are feeling even less charitable after a bruising, soul-sapping nine months that has drained the club of credit in its community and hollowed out what was left of the enthusiasm of the city. Rebellion is on everyone’s lips but in reality it is the apathy since the turn of the year that has been suffocating. The 2013/14 campaign has been the season of missed opportunity and of contempt from the top from the moment Kinnear was appointed. The noise of the crowd has been replaced by the grinding of gears as the club moves backwards. Something simply has to change. For a significant number now, the change must start in the dug-out. Alan Pardew is stretching credibility to breaking point when he implores them to “put the club first” by resisting the calls to walk out of the ground on 60 minutes. Does he blame them when it feels as if the owner and his cronies (Pardew included) have often done the polar opposite of putting the club first? An air of protest crackles around St James’ Park. It is loose and perhaps without a definitive direction but it is definitely discernible. The debate yesterday was whether fans would or would not heed a call to walk out after 60 minutes, but whatever happens, Pardew is struggling for a mandate to continue past this summer. No wonder: the curtain comes down on a campaign that has turned the air toxic on Tyneside today. The balance sheet will record a top-10 finish and a handsome profit but this season has come at a serious cost. None of this would matter if his teams were performing, but six straight defeats have focused minds about the football being played under Pardew. It is functional, uninspiring stuff and bears little resemblance to the promise to attack and entertain. Just recently, the performances of some players have been a disgrace to the good name of the club. The worry for Pardew is that message will arrive at the door of the owner before long. One senior player has told a leading agent that the players no longer have faith in the manager’s ability to change things – or deliver on his promises. Add that to discontent on the terraces and things start to look untenable. Culpability goes way beyond the manager, though. United have long attempted in their blithe statements to give the idea that they are working towards a goal. In his rambling statement last month, Lee Charnley assured us “we will progress the Club, both on and off the field over the coming years”. Yet strip away the spin and PR and what is left behind is the unerring sense that Newcastle have regressed this year: with a manager unable or unwilling to make the most of a talented, cosmopolitan but fragile group of players and a set-up that reacts to criticism and dissent by withdrawing ever inwards. It began in June. Manchester City had spirited Ferran Soriano and Txiki Begiristain away from the Nou Camp, where they had shaped a sporting dynasty. On Tyneside, we had been given Kinnear and his associates. There is nothing progressive about it. Off-the-field, this has been a year of press bans and clumsy attempts to ostracise media that do not pay for interviews. There was an instruction to work closely with Sports Direct News: thankfully that has been ended now. The club still want a written press partner. Those ongoing attempts are why you do not read interviews with players any more – unless Hatem Ben Arfa is desperate to get his message out, of course. Certain people at the club do not see the goodwill that they can generate by communicating a positive, constructive message. It is dangerous and counter-productive and many others within the club agree. Not the ones who are making the call, though. What the club needs this summer is to start listening to those within its organisation that will challenge and suggest a new direction. There are employees who have the best interests of the club at heart, but they are cowed by a ‘my-way-or-the-high-way’ approach from the top. It is not conducive to success or rediscovering the club’s soul. Some supporters have pledged to walk away. Corporate clients are toying with the idea of ditching a toxic brand. Agents in France watched Monday’s events and it makes United look like a basket case. None of this is helpful. The chances are Newcastle will finish ninth this season and yet this feels like the most damaging season since the club were relegated to the Championship in 2008. Some theorise that this is even worse. At least supporters had defiance and energy in the face of the club tottering into the abyss: the atmosphere at home games since the turn of the year has been funereal.